5. To transact such other business as may properly come before the Annual Meeting or any adjournments or postponements thereof. Only stockholders of record at the close of business on April 18, 2019 are entitled to notice of and to vote at the Annual Meeting and at any adjournments or postponements of the Annual Meeting. A list of stockholders entitled to vote at the meeting will be available for inspection by stockholders, for any purpose germane to the meeting, at the Annual Meeting and during normal business hours during the ten-day period immediately prior to the Annual Meeting, at our principal executive offices at 195 Montague Street, 14th Floor, Brooklyn, New York 11201. All stockholders are cordially invited to attend the Annual Meeting in person. If you plan to attend the Annual Meeting, prior to June 5, 2019, you must inform the Company’s outside counsel, via e-mail at NYC-Reception@thompsonhine.com or by telephone at 212-692-3500, of your intent to attend the Annual Meeting. To gain access to the offices of Thompson Hine, you must present a form of picture identification to the security officer at the desk located on the main floor of 335 Madison Avenue. You will be provided a pass to permit access to the building’s elevators and will proceed to the 12th floor offices of Thompson Hine. Important Notice Regarding the Availability of Proxy Materials for the Annual Meeting to be held on June 5, 2019: In accordance with the rules of the Securities and Exchange Commission (the “SEC”), we are advising our stockholders of Internet availability of our proxy materials related to the Annual Meeting. SEC rules allow companies to provide access to proxy materials in one of two ways. Because we have elected to use the “full set delivery” option, we are delivering our proxy materials to our stockholders by providing paper copies, as well as providing access to our proxy materials on a publicly accessible website. Our proxy statement, proxy card, Annual Report on Form 10-K for the year ended December 31, 2018 and this notice are available at www.sgblocks.com or www.astproxyportal.com/ast/21306. You can vote by proxy over the Internet by following the instructions provided in the proxy materials that were mailed to you on or about April 26, 2019, or you can vote by mail or by telephone. Your promptness in voting by proxy will assist in its expeditious and orderly processing and will ensure that you are represented at the Annual Meeting. Proxies are being solicited on behalf of the Board. If you vote by proxy, you may nevertheless attend the Annual Meeting and vote your shares in person. TO ENSURE YOUR REPRESENTATION AT THE MEETING, YOU ARE URGED TO READ THIS PROXY STATEMENT AND SUBMIT YOUR PROXY OR VOTING INSTRUCTIONS AS SOON AS POSSIBLE BY FOLLOWING THE INSTRUCTIONS IN THE PROXY MATERIALS, WHICH WERE MAILED TO YOU ON OR ABOUT APRIL 26, 2019. YOU MAY VOTE ONLINE, BY TELEPHONE OR BY MAILING YOUR SIGNED PROXY CARD IN THE ENCLOSED RETURN ENVELOPE. This proxy statement is being furnished to you in connection with the solicitation of proxies by the Board of Directors (the “Board”) of SG Blocks, Inc. (the “Company,” “we,” “us” or “our”). The 2019 Annual Meeting of Stockholders (the “Annual Meeting”) will be held on Wednesday, June 5, 2019, at 11:00 a.m., local time, at the offices of Thompson Hine LLP (“Thompson Hine”), 335 Madison Avenue, 12th Floor, New York, New York 10017. The Company’s telephone number is (646) 240-4235. The purpose of the Annual Meeting and the matters to be acted upon are set forth under the headings Proposal 1 — Election of Directors, Proposal 2 — Ratification of Appointment of Independent Registered Public Accounting Firm, Proposal 3 — Advisory Approval of Named Executive Officer Compensation and Proposal 4 — Approval of an Amendment to the Company’s Certificate of Incorporation to Decrease the Number of Authorized Shares of Common Stock below and in the Notice of Annual Meeting of Stockholders. You are requested to promptly vote by proxy by following the instructions provided on the proxy card, which was mailed to you on or about April 26, 2019. You may vote online, by telephone or by mailing your signed proxy card in the enclosed return envelope. How is the Company distributing the proxy materials? The rules of the Securities and Exchange Commission (the “SEC”) permit us to make our proxy materials available in one of two ways: the “full set delivery” option or the “notice only” option. A company may use a single method for all of its stockholders or may use both methods. We have elected to use the full set delivery option to deliver the proxy materials for the Annual Meeting to each stockholder of record as of the Record Date (as defined below). As such, on or about April 26, 2019, we will be mailing paper copies of our proxy materials to stockholders, as well as providing access to the proxy materials at www.sgblocks.com or www.astproxyportal.com/ast/21306. We may decide not to use the full set delivery option in the future; however, you will still have the right to request a free set of proxy materials by mail. Who may vote at and attend the Annual Meeting? You are entitled to notice of the Annual Meeting and to vote, in person or by proxy, at the Annual Meeting if you owned shares of the Company’s common stock, par value $0.01 per share (“Common Stock”), as of the close of business on April 18, 2019, which has been fixed as the record date (the “Record Date”) for the Annual Meeting. On the Record Date, [●] shares of Common Stock were issued and outstanding, held by [●] holders of record. Holders of record of our Common Stock are entitled to one vote per share. All stockholders as of the Record Date, or their duly appointed proxies, may attend the Annual Meeting. If you attend the Annual Meeting in person, you will be asked to present photo identification (such as a state-issued driver’s license) and proof of your ownership of shares of Common Stock before entering the meeting. Please note that if you hold shares in “street name” (through a bank or broker, for example), you will need to bring a recent brokerage statement or a letter from your broker or bank reflecting your ownership of our Common Stock as of the Record Date. If you want to vote shares you hold in street name in person at the Annual Meeting, you must bring a legal proxy in your name from the broker, bank or other nominee that holds your shares. The presence at the Annual Meeting, in person or by proxy, of the holders of a majority of our Common Stock issued and outstanding and entitled to vote as of the Record Date, present in person or represented by proxy, will constitute a quorum. As of the Record Date, [●] shares of Common Stock constituted a majority. Broker “non-votes” (as described below), abstentions and proxies marked “withhold” for the election of directors will be counted for purposes of determining the presence or absence of a quorum for the transaction of business. If you hold your shares through a broker, your broker’s ability to vote your shares for you is governed by applicable stock exchange rules. Without your specific instruction, a broker or other nominee may only vote your shares on routine proposals. Your broker will submit a proxy card on your behalf, but leave your shares unvoted on non-routine proposals—this is known as a “broker non-vote.” Without your specific instruction, your broker will not vote your shares on Proposal 1 — Election of Directors, Proposal 3 — Advisory Approval of Named Executive Officer Compensation or Proposal 4 — Approval of an Amendment to the Company’s Certificate of Incorporation to Decrease the Number of Authorized Shares of Common Stock, which are considered “non-routine” proposals under applicable stock exchange rules. Non-votes will not be counted “FOR” or “AGAINST” Proposal 1, Proposal 2 or Proposal 3; however, broker non-votes will have the same effect as a vote “AGAINST” Proposal 4. Proposal 2 — Ratification of Appointment of Independent Registered Public Accounting Firm is a routine matter on which your broker will vote without your instruction. Therefore, broker non-votes are not expected to occur with respect to Proposal 2. Broker non-votes will still be counted toward the quorum. How will abstentions be counted? Generally, choosing to “ABSTAIN” from a vote is counted as a vote “AGAINST” a particular proposal. However, a “WITHHOLD” vote for the election of any director (as in Proposal No. 1 of this proxy statement) will not be counted as a “FOR” or “AGAINST” vote. Even if you choose to “ABSTAIN” (or “WITHHOLD”) on any or every proposal, your shares will still be counted toward the quorum. For Proposal 1 — Election of Directors, the nominees for director who receive the most votes cast (also known as a plurality), either in person or by proxy, will be elected. You may vote either FOR all of the nominees, WITHHOLD your vote from all of the nominees or WITHHOLD your vote from any one of the nominees. Votes that are withheld and broker non-votes, if any, will not be included in the vote tally for, and will have no effect on, the election of directors, except to the extent the failure to vote for a nominee results in another nominee receiving a larger number of votes. Adoption of Proposal 2 — Ratification of Appointment of Independent Registered Public Accounting Firm and Proposal 3 — Advisory Approval of Named Executive Officer Compensation requires the affirmative vote of the holders of the majority of shares present in person or represented by proxy at the Annual Meeting and entitled to vote for each of these proposals (meaning that, of the shares represented at the Annual Meeting and entitled to vote, a majority of them must be voted “FOR” the proposal for it to be approved). In determining whether Proposals No. 2 and No. 3 have received the requisite number of affirmative votes, abstentions will be included in the vote tally and will have the same effect as a vote “AGAINST” the proposals, and broker non-votes, if any, will have no effect on the votes for these proposals. Proposal 4 — Approval of an Amendment to the Company’s Certificate of Incorporation to Decrease the Number of Authorized Shares of Common Stock requires the affirmative vote of the holders of a majority of the outstanding shares of Common Stock (meaning that, of the outstanding shares of Common Stock, a majority of them must be voted “FOR” the proposal for it to be approved). Abstentions and broker non-votes will have the effect of a vote “AGAINST” this proposal. To ensure your shares are voted at the meeting, you are urged to provide your proxy instructions promptly online, by telephone or by mailing your signed proxy card in the enclosed envelope. Please refer to the instructions on the proxy card. Authorizing your proxy will not limit your right to attend the Annual Meeting and vote your shares in person. Your proxy (one of the individuals named in your proxy card) will vote your shares per your instructions. If you fail to provide instructions on a properly submitted proxy, your proxy will vote as recommended by the Board, as described below. If you have shares held by a broker or other nominee, you may instruct your broker or nominee to vote your shares by following the instructions that the broker or nominee provides to you. Most brokers and nominees allow you to vote by mail, telephone and on the Internet. 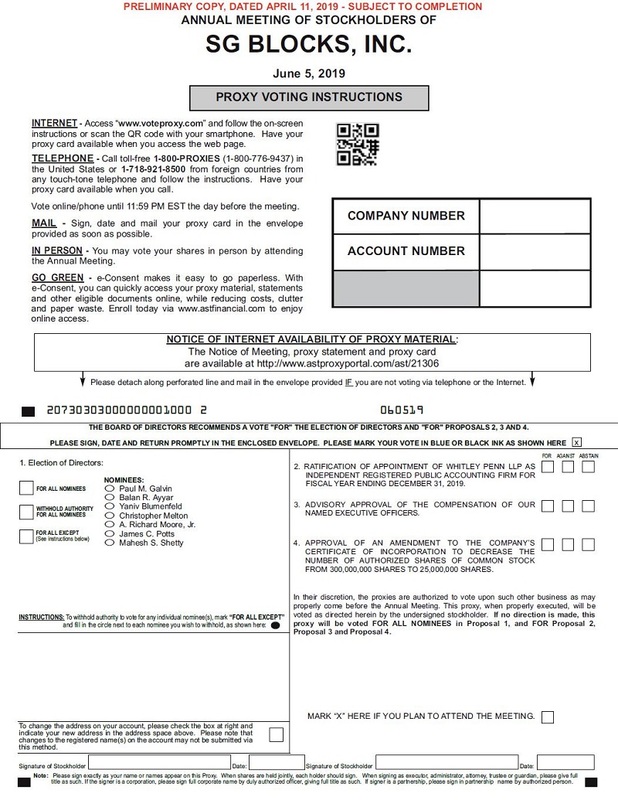 As discussed above, under applicable stock exchange rules, Proposal 1 — Election of Directors, Proposal 3 — Advisory Approval of Named Executive Officer Compensation and Proposal 4 — Approval of an Amendment to the Company’s Certificate of Incorporation to Decrease the Number of Authorized Shares of Common Stock are “non-routine” matters, meaning that brokers or other nominees who have not been furnished voting instructions by their clients will not be authorized to vote in their discretion on those proposals. Proposal 2 — Ratification of Appointment of Independent Registered Public Accounting Firm is considered a “routine” matter, which means brokers or nominees who have not been furnished voting instructions by their clients will be authorized to vote on that proposal. You may revoke your proxy and change your vote at any time before the final vote at the Annual Meeting. You may revoke your proxy by attending the Annual Meeting and voting in person or by delivering to our Corporate Secretary a duly executed revocation of proxy or a new proxy bearing a later date. Attendance at the Annual Meeting will not itself constitute a revocation of a proxy. If you do not provide instructions on your proxy card, the persons named as proxy holders on the proxy card will vote in accordance with the recommendations of the Board. ● approval of an amendment to the Company’s Amended and Restated Certificate of Incorporation (the “Certificate of Incorporation”) to decrease the number of authorized shares of Common Stock from 300,000,000 authorized shares to 25,000,000 authorized shares. We do not expect that any other matters will be presented for consideration at the Annual Meeting. If, however, any other matters are properly presented, the persons named as proxies intend to vote on such matters in accordance with their judgment, including any proposal to adjourn or postpone the Annual Meeting. Who pays for expenses incurred in connection with the solicitation of proxies? We are making this solicitation of proxies and will pay the entire expense of preparing, printing and mailing these proxy materials. Officers and employees of the Company may solicit the return of proxies, but will not receive additional compensation for those efforts. We have engaged Alliance Advisors, LLC to provide various services relating to the solicitation of proxies, including conducting voting campaigns and compiling voting reports, for an aggregate fee of approximately $6,500. We will request that brokers, banks, custodians, nominees, and other fiduciaries send proxy materials to all beneficial owners and, upon request, will reimburse them for their expenses. Solicitations may be made by telephone, e-mail or other electronic means, or in person. If you need assistance with voting or have questions regarding the Annual Meeting, please contact the firm assisting us in the solicitation of proxies: Alliance Advisors, LLC, 200 Broadacres Drive, 3rd Floor, Bloomfield, NJ 07003, toll free phone number 844-885-0178. At the Annual Meeting, seven nominees will be elected as directors. The Company’s seven nominees are named below. Proxies cannot be voted for a greater number of persons than the number of nominees named in this proposal. Our Board, based on the recommendation of the independent members of the Board, has nominated each of Paul M. Galvin, Balan R. Ayyar, Yaniv Blumenfeld, Christopher Melton, A. Richard Moore, Jr., James C. Potts and Mahesh S. Shetty to stand for election at the meeting. Each nominee has consented to be named in this proxy statement and to serve as a director if elected. However, if any nominee becomes unable to stand for election at the Annual Meeting, proxies will be voted in favor of the remainder of the nominees and may be voted for substitute nominees, unless our Board chooses to reduce the number of directors serving on the Board. Each nominee, if elected, will be entitled to serve until the 2020 annual meeting of stockholders and until a successor is duly elected and qualified or until his earlier death, resignation or removal. Because we do not have a standing nominating committee, our independent directors evaluate and recommend director nominees for the Board’s consideration. Each of the director nominees for the Annual Meeting was evaluated and recommended by the independent directors and unanimously approved by the Board. The Board has not established specific criteria or minimum qualifications that must be met by director nominees, but recognizes the value of nominating candidates who bring a variety of experiences, skills, perspectives and backgrounds to Board deliberations. The independent directors, when identifying nominees to serves as directors of the Company, consider each nominee’s qualifications, including educational, business and professional experience, such as real estate, manufacturing and finance, and whether such nominees will satisfy the independence standards under Nasdaq and SEC rules and regulations. We do not have a set policy or process for considering diversity in identifying nominees, but strive to identity and recruit nominees with a broad diversity of experience, talents, professions, backgrounds, perspective, age, gender, ethnicity and country of citizenship, and who possess the commitment necessary to make a significant contribution to the Company. Board nominees should be committed to enhancing long-term stockholder value and should possess high standards of integrity and ethical behavior. The independent directors may also consider other elements as they deem appropriate. We believe that the continuing service of qualified incumbent directors promotes stability and continuity in the function of the Board, contributing to the Board’s ability to work as a collective body, while giving us the benefit of the familiarity and insight into our affairs that our directors have accumulated during their tenure. Therefore, the independent directors will generally re-nominate incumbent directors who continue to be qualified for Board service and are willing to continue in such role. If an incumbent director is not standing for re-election or if a vacancy occurs between annual stockholder meetings, the Committee will seek out potential candidates for Board appointment who meet the criteria for selection as a nominee and have the specific qualities or skills being sought. Director candidates will be selected based upon input from the members of the Board, senior management of the Company and, if the Committee deems appropriate, a third-party search firm. We will also consider director candidates submitted in writing by stockholders. A stockholder who wishes to nominate a person for election must provide written notice to the Company in accordance with the procedures set forth in our bylaws. Among other requirements, such notification shall contain certain background information and the consent of each nominee to serve as one our directors, if elected. Stockholder nominations for election to the Board for the 2020 annual meeting of stockholders must be made by written notification received by us no later than Monday, April 6, 2020. All potential director candidates will be evaluated in the same manner, regardless of the source of the recommendation. Balan R. Ayyar(3) 53 January 2017 Co-Founder and Chief Executive Officer of Percipient.ai Inc.
Paul M. Galvin was appointed as a director and the Company’s Chief Executive Officer upon consummation of the reverse merger among CDSI Holdings Inc., CDSI Merger Sub, Inc., the Company, and certain stockholders of the Company on November 4, 2011 (the “Merger”). Mr. Galvin is a founder of SG Blocks, LLC, the predecessor entity of the Company. He has served as the Chief Executive Officer of the Company since April 2009 and as a director of the Company since January 2007. Mr. Galvin has been a managing member of TAG Partners, LLC (“TAG”), an investment partnership formed for the purpose of investing in the Company, since October 2007. Mr. Galvin brings over 20 years of experience developing and managing real estate, including residential condominiums, luxury sales and market rate and affordable rental projects. Prior to his involvement in real estate, he founded a non-profit organization that focused on public health, housing and child survival, where he served for over a decade in a leadership position. During that period, Mr. Galvin designed, developed and managed emergency food and shelter programs through New York City’s Human Resources Administration and other federal and state entities. From November 2005 to June 2007, Mr. Galvin was Chief Operating Officer of a subsidiary of Yucaipa Investments, where he worked with religious institutions that needed to monetize underperforming assets. While there, he designed and managed systems that produced highest and best use analyses for hundreds of religious assets and used them to acquire and re-develop properties across the U.S. Mr. Galvin has served on the board of directors of ToughBuilt Industries, Inc. (Nasdaq: TBLT), a designer, manufacturer and distributor of innovative tools and accessories to the building industry, since November 2018, and currently serves as the chair of its compensation committee and as a member of each of the audit and nominating and governance committees. Mr. Galvin also currently serves on the advisory board of Callegro Investments, LLC and Sandhill Crane Partners, LLC and the advisory committee of May River Partners, LP. Mr. Galvin holds a Bachelor of Science in Accounting from LeMoyne College and a Master’s Degree in Social Policy from Fordham University. He was formerly an adjunct professor at Fordham University’s Graduate School of Welfare. Mr. Galvin previously served for 10 years on the Sisters of Charity Healthcare System Advisory Board and six years on the Board of SentiCare, Inc. In 2011, the Council of Churches of New York recognized Mr. Galvin with an Outstanding Business Leadership Award. Mr. Galvin’s pertinent experience, qualifications, attributes and skills include his managerial experience and the knowledge and experience he has attained in the real estate industry. Balan R. Ayyar was appointed as a director of the Company on January 30, 2017. General Ayyar is the founder and CEO of Percipient.ai Inc., a Silicon Valley advanced analytics firm providing artificial intelligence, machine learning and computer vision for U.S. national security missions since January 2017. He previously served at Sevatec, Inc., an IT solutions firm specializing in cyber, data science, cloud engineering and system integration across national security missions, where he served as President and Chief Executive Officer from April 2016 to January 2017; President and Chief Operating Officer from October 2015 to April 2016; and as the Chief Operating Officer from October 2014 to October 2015. Before joining the private sector, General Ayyar served as the Commanding General of Combined Joined Interagency Task Force 435 in Kabul, Afghanistan, beginning in 2013. Prior to that, General Ayyar led the U.S. Air Force Recruiting Service. He served in four combatant commands, as the military assistant to the Secretary of Defense, and as a White House Fellow. General Ayyar has received a number of awards and decorations for his service, including a Bronze Star, an Air Force Commendation Medal and a Presidential Service Badge. He is a member of the Council on Foreign Relations and serves on the Board of Fairfax Futures, an early childhood education non-profit partnership. General Ayyar has a Bachelor of Science in international affairs from the U.S. Air Force Academy, Master’s degrees from Maxwell Air Force Base, Alabama, Auburn University and the Industrial College of the Armed Forces, National Defense University in Washington, D.C.
General Ayyar’s pertinent experience, qualifications, attributes and skills include his extensive leadership experience and technology background. Yaniv Blumenfeld joined the Board in April 2018. He founded Glacier Global Partners LLC in 2009 and is responsible for its strategic direction and oversees its investments and day-to-day management, including origination, underwriting, closing, investor relations and asset management functions. Mr. Blumenfeld has over 20 years of real estate experience, 13 years of which have been with leading Wall Street firms, where he was responsible for structuring, underwriting, pricing, securitizing and syndicating over $16 billion of commercial real estate loans and equity transactions. Prior to founding Glacier Global Partners LLC, Mr. Blumenfeld was a Managing Director at The Bear Stearns Companies, Inc. and JPMorgan Chase & Co., and, in such role, was responsible for structuring and closing over $2 billion in real estate debt and equity transactions for institutional clientele. Prior to that, Mr. Blumenfeld was a Managing Director and Head of the CMBS Capital Markets Group for the U.S. at EuroHypo AG, then world’s largest real estate investment bank. In that capacity, Mr. Blumenfeld expanded the large loan CMBS group and oversaw the structuring, pricing, securitization and syndication functions and served on the bank’s investment committee in charge of approving all transactions. He designed and implemented risk-control measures, standardized underwriting and pricing models and structured over $4 billion of real estate loans. Other positions previously held by Mr. Blumenfeld include Senior Vice President at Lehman Brothers, PaineWebber/UBS and Daiwa Securities. Prior to joining the banking industry, Mr. Blumenfeld worked as a real estate consultant at Ernst & Young real estate consulting group, advising real estate owners and operators, and various investment banks. Mr. Blumenfeld received a Bachelor of Science in real estate finance from Cornell University School of Hotel Administration. He is a member of the CRE Finance Council, was a guest lecturer at Columbia University, and was a recipient of the Young Jewish Professional NYC Real Estate Entrepreneur & Achievement Award in 2013. He is also involved with various philanthropic organizations, including The American Israel Public Affairs Committee, White Plains Hospital, American Friends of Rabin Medical Center and is on the board of directors of ArtsWestchester and the White Plains Business Improvement District. Mr. Blumenfeld’s pertinent experience, qualifications, attributes and skills include his real estate finance, developments, investment banking and capital raising. Christopher Melton was appointed as a director of the Company upon consummation of the Merger on November 4, 2011. Mr. Melton is Principal and co-founder of Callegro Investments, LLC, a specialist land investor investing in the southeastern U.S. He also serves as director and portfolio manager of Sandhill Crane Partners, LLC and May River Partners, LP, funds sponsored by Callegro. Since September 2018, Mr. Melton has served as a principal at TNT Legacy, LLC, a land acquisition and development enterprise based in Florida. He has also served as a sales agent as MSK Commercial Services, a commercial real estate company, since February 2018. From 2000 to 2008, Mr. Melton was a Portfolio Manager for Kingdon Capital Management (“Kingdon”) in New York City, where he ran an $800 million book in media, telecom and Japanese investment. Mr. Melton opened Kingdon’s office in Japan, where he set up a Japanese research company. From 1997 to 2000, Mr. Melton served as a Vice President at JPMorgan Investment Management as an equity research analyst, where he helped manage $500 million in REIT funds under management. Mr. Melton was a Senior Real Estate Equity Analyst at RREEF Funds in Chicago from 1995 to 1997. RREEF Funds is the real estate investment management business of Deutsche Bank’s Asset Management division. Mr. Melton earned a Bachelor of Arts in Political Economy of Industrial Societies from the University of California, Berkeley in 1995. Mr. Melton earned Certification from University of California, Los Angeles’s Anderson Director Education Program in 2014. Mr. Melton previously served on the board of World Education and Development Fund, a non-profit organization that focuses on education for underprivileged children in Latin America. Mr. Melton’s pertinent experience, qualifications, attributes and skills include financial literacy and expertise, managerial experience and the knowledge and experience he has attained through his real estate investment and development activities. A. Richard Moore, Jr. joined the Board on February 2, 2017, and has served as Lead Independent Director since his appointment by the Board in April 2018. Mr. Moore is an independent management consultant. From February 2013 through September 2016, he was managing director for non-bank activities of Strategic Growth Bancorp Incorporated (“Strategic Growth”) in El Paso, Texas, focusing on Strategic Growth’s mortgage activities and new business initiatives. From November 2004 through December 2012, prior to joining Strategic Growth, Mr. Moore held various positions with Verde Realty, a Maryland REIT with headquarters in El Paso and Houston, including Executive Vice President, Chief Financial Officer and Corporate Secretary. Prior to that, Mr. Moore served as Chairman and Chief Financial Officer of Security Capital European Realty; managing director of the SC-European Realty and managing director of the capital division of Security Capital Group Incorporated (formerly NYSE: SCZ); interim Chief Financial Officer of Homestead Village Incorporated (formerly NYSE: HSD); and spent 16 years in the Real Estate Department of the Investment Banking Division of Goldman, Sachs & Co., where he developed and led the firm’s sale/leaseback business and later headed the firm’s REIT banking activities. Mr. Moore has been a guest lecturer on real estate finance and the REIT structure at Columbia University, New York University, and Southern Methodist University. He served as director and chairman of the Audit Committee of Guardian Mortgage Company, Inc., in Dallas, Texas, until May 2016. Mr. Moore has been a trustee of Borderplex Realty Trust, a private REIT based in El Paso, Texas, since May 2018, where he currently serves as a member of Borderplex Realty Trust’s executive committee, chairman of the compensation committee, and a member of the audit committee; previously, Mr. Moore served as an advisory trustee of Borderplex Realty Trust, including serving on its compensation committee. He is also a director of Paso del Norte Charitable Foundation, where he serves as chairman of the investment committee. Mr. Moore is chairman of the Design Advisory Committee and a member of the Design Review Board for the Village of Manchester, Vermont. Mr. Moore holds a B.A. and Master of Divinity from Southern Methodist University and a Master of Business Administration from the Harvard Business School. Mr. Moore’s pertinent experience, qualifications, attributes and skills include his extensive background in real estate development and financing; his financial expertise; and his corporate governance experience, including his years of service on other audit and compensation committees. James C. Potts, who joined the Board on December 27, 2018, currently serves as President of State SteelWorks, LLC (“State Steel”) in Atlanta, Georgia, of which he is also a founding principal. His responsibilities include establishing and overseeing the strategic direction and operating performance of State Steel. Before his tenure with State Steel, Mr. Potts served as Chairman of Verde Apartment Communities, a private REIT involved in the development, construction and management of upscale multi-family communities. Prior to that, Mr. Potts held a number of senior positions with Security Capital Group Incorporated until its sale to General Electric Capital Corporation, including serving as Co-Chairman and Chief Investment Officer of Security Capital Atlantic Incorporated, an Atlanta-based equity REIT that owned, acquired, developed and operated income-producing multifamily communities in the south Atlantic, mid-Atlantic and mid-western regions of the United States, and President and Chief Operating Officer of Homestead Village Incorporated, an extended-stay hotel company that developed and operated hotels across the continental U.S. Prior to that, Mr. Potts was a Senior Partner with Trammell Crow Residential and a member of its management board. Mr. Potts earned a B.S.I.M. degree from the Georgia Institute of Technology and an M.B.A. from Georgia State University. Mr. Potts has been a director of Borderplex Realty Trust since 2015. Mr. Potts’ extensive experience in senior positions in the real estate industry, in both publicly-traded and private organizations, and in multiple markets throughout the U.S., including investment analysis, development, construction and operations positions, and his prior experience serving on the board of directors of both public and private companies, make him a valuable member of the Board. Mahesh S. Shetty has served as a director of the Company since July 1, 2016 and has served as the Company’s Chief Financial Officer since July 29, 2016 and additionally as its President since February 1, 2018. Mr. Shetty previously served in several senior roles at PFO Global, Inc. (OTC: PFGBQ), an innovative manufacturer and commercial provider of advanced prescription lenses, including as chief restructuring officer from December 2015 through December 2016; chief financial officer from September 2016 through December 2016; and as a consultant to the Company from December 2016 through June 2017, through RSM Advisors, Inc., of which Mr. Shetty is the principal. From 2008 to 2015, Mr. Shetty served as the Partner, Chief Operating Officer and Chief Financial Officer at Encore Enterprises, Inc. (“Encore”), a private real estate investment firm with over $750 million in assets. He had senior management oversight and responsibility for all of Encore’s finance, risk management, human resources and technology. Prior to joining Encore, from May 2006 to January 2008, Mr. Shetty was the Chief Financial Officer of North American Technologies Group, Inc., a manufacturing company focused on the transportation industry. Mr. Shetty began his career in public accounting and has served in executive finance and operational leadership roles with Fortune 500 and mid-size private and public companies in the manufacturing, technology and service industries. He earned a bachelor’s degree from Osmania University, India and received his M.B.A. from the University of Texas, Dallas. He is a Certified Public Accountant, a Certified Information Technology Professional, a Chartered Global Management Accountant and a Fellow Chartered Accountant. Mr. Shetty serves on the National Board of Financial Executives International; on the executive board, and previously served as chairman, of the U.S. India Chamber of Commerce, Dallas-Fort Worth; as an advisor of EZlytix LLC, a private cloud-based business intelligence software company; and on the board of B.I.G. Logistics, LLC, a Texas-based warehouse and distribution management corporation. Mr. Shetty previously served on the board and as the treasurer of Mothers Against Drunk Driving, and on the board of Scoobeez Global, Inc. (formerly ABT Holdings, Inc.) (OTC: SCBZ). Mr. Shetty’s pertinent experience, qualifications, attributes and skills include his expertise in financial and accounting matters, strategy, technology and operations. On October 15, 2015, the Company and its subsidiaries filed voluntary petitions for reorganization under Chapter 11 of the United States Bankruptcy Code in the United States Bankruptcy Court for the Southern District of New York. At that time, each of Messrs. Galvin and Melton served as a director of the Company, and continued to serve as such after the Company’s emergence from bankruptcy on June 30, 2016. The affirmative vote of a plurality of the votes cast, either in person or by proxy, at the Annual Meeting is required for the election of these nominees as directors. You may vote “FOR” or “WITHHOLD” authority to vote for each of the nominees for director. If you “WITHHOLD” authority to vote with respect to one or more nominees, such vote will have no effect on the election for such nominees. Broker non-votes additionally have no effect on the election for such nominees. Shares represented by properly executed proxies will be voted, if specific instructions are not otherwise given, in favor of each nominee. OF THE NOMINEES LISTED ABOVE AS DIRECTORS. The Board recognizes that one of its key responsibilities is to evaluate and determine its optimal leadership structure so as to provide independent oversight of management. Our Board is currently led by a Chairman of the Board who also serves as our Chief Executive Officer. The Board understands that the right Board leadership structure may vary depending on the circumstances, and our independent directors periodically assess these roles and the Board leadership to ensure the leadership structure best serves the interests of the Company and stockholders. Mr. Galvin currently holds the Chairman and Chief Executive Officer roles. We also have a Lead Independent Director elected by the majority of the Board. Mr. Moore currently serves as the Lead Independent Director. The responsibilities of the Lead Independent Director include, among others: (i) serving as primary intermediary between non-employee directors and management; (ii) approving the agenda and meeting schedules for the Board; (iii) advising the Chairman of the Board as to the quality, quantity and timeliness of the information submitted by management to directors; (iv) recommending director candidates and selections for the membership and chairman position for each committee of the Board; (v) calling meetings of independent directors; and (vi) serving as liaison for consultation and communication with stockholders. We believe the current leadership structure, with combined Chairman and Chief Executive Officer roles and a Lead Independent Director, best serves the Company and its stockholders at this time. Mr. Galvin possesses detailed and in-depth knowledge of the Company and the industry and the issues, opportunities and challenges we face, and is best positioned to ensure the most critical business issues are brought for consideration by the Board. In addition, having one leader serving as both the Chairman and Chief Executive Officer provides decisive, consistent and effective leadership, as well as clear accountability to our stockholders and customers. This enhances our ability to communicate our message and strategy clearly and consistently to our stockholders, employees, customers and suppliers, particularly during times of turbulent economic and industry conditions. The Board believes the appointment of a strong Lead Independent Director and the use of regular executive sessions of the non-management directors, along with a majority the Board being composed of independent directors, allow it to maintain effective oversight of management. We believe that the combination of the Chairman and Chief Executive Officer roles is appropriate in the current circumstances and, based on the relevant facts and circumstances, separation of these offices would not serve our best interests and the best interests of our stockholders at this time. Nasdaq Listing Rule 5605 requires a majority of a listed company’s board to be comprised of independent directors. In addition, the Nasdaq Listing Rules require that, subject to specified exceptions, each member of a listed company’s audit and compensation committees be independent under the Securities Exchange Act of 1934, as amended (the “Exchange Act”). Audit committee members and compensation committee members must also satisfy the independence criteria set forth in Rules 10A-3 and 10C-1 under the Exchange Act, respectively. Under Nasdaq Listing Rule 5605(a)(2), a director will only qualify as an “independent director” if, in the opinion of the Board, that person does not have a relationship that would interfere with the exercise of independent judgment in carrying out the responsibilities of a director. In order to be considered independent for purposes of Exchange Act Rule 10A-3, an Audit Committee member may not, other than in his or her capacity as a member of the Audit Committee, the Board or any other committee of the Board, accept, directly or indirectly, any consulting, advisory or other compensatory fee from the Company or any of its subsidiaries, or otherwise be affiliated with the Company or any of its subsidiaries. In order for Compensation Committee members to be considered independent for purposes of Exchange Act Rule 10C-1, the Board must consider all factors specifically relevant to determining whether a director has a relationship to the Company that is material to that director’s ability to be independent from management in connection with the duties of a Compensation Committee member, including, but not limited to: (1) the source of compensation of the director, including any consulting advisory or other compensatory fee paid by the Company to the director; and (2) whether the director is affiliated with the Company or any of its subsidiaries or affiliates. The Board has reviewed the materiality of any relationship that each of our nominated directors has with the Company and has determined that each of Messrs. Ayyar, Blumenfeld, Melton, Moore and Potts is “independent” in accordance with the Nasdaq Listing Rules. Messrs. Galvin and Shetty are not considered independent. As such, we currently have a majority independent Board and fully independent Audit and Compensation Committees. Sean M. McAvoy and Neal Kaufman, each of who served as a director during 2018, were not considered independent. Mr. Kaufman served as a member of our Compensation Committee until June 2018, pursuant to Nasdaq’s phase-in exemption for newly public companies. There are no family relationships between any of our directors, director nominees or executive officers. The Board is the ultimate decision-making body of the Company, except with respect to those matters to be decided by the stockholders. It selects the Chief Executive Officer and other members of the senior management team, which is charged with the conduct of the Company’s day-to-day business. The Board acts as an advisor and counselor to senior management and ultimately monitors its performance. The function of the Board to monitor the performance of senior management is facilitated by the presence of non-employee directors who have substantive knowledge of the Company’s business. Our Board has established a separate standing Audit Committee and Compensation Committee. We do not have a standing nominating committee and instead, as permitted by Nasdaq rules, a majority of the independent directors of the Board recommend director nominees for the consideration of the full Board. Each of the Audit Committee and Compensation Committee operates pursuant to a written charter, a copy of which may be viewed on the Company’s website at https://www.sgblocks.com under the “Investors—Corporate Governance” tab. As of the Record Date, the members of our Audit Committee are Mr. Melton, who serves as chairperson, Mr. Blumenfeld and Mr. Moore. The Audit Committee Charter requires that the Audit Committee consist of at least three members of the Board, each of whom is required to be independent as defined by Nasdaq and SEC rules. The Board has determined that each member of the Audit Committee is independent, as defined by Rule 10A-3 of the Exchange Act and Nasdaq Marketplace Rule 5605(a)(2). The Board has also determined that Mr. Moore is an “audit committee financial expert,” as defined in Item 407(d)(5) of Regulation S-K under the Exchange Act. The Audit Committee is directly responsible for the appointment, compensation, retention and oversight of our independent registered public accounting firm. Functions of the Audit Committee include, but are not limited to, reviewing the results and scope of the audit performed, and the financial recommendations provided by, our independent registered public accounting firm and coordinating the Board’s oversight of our internal financing and accounting processes. All audit services to be provided to the Company by our independent public accounting firm, Whitley Penn, are pre-approved by the Audit Committee prior to the initiation of such services (except for items exempt from pre-approval requirements under applicable laws and rules). The Audit Committee approved all services provided by Whitley Penn to us during 2018. As of the Record Date, the members of our Compensation Committee are Mr. Moore, who serves as chairperson, General Ayyar and Mr. Melton. The Compensation Committee Charter requires that the Compensation Committee consist of at least two members of the Board, each of whom is required to be independent as defined by Nasdaq rules. The Board has determined that each member of the Compensation Committee is independent, as defined in Nasdaq Marketplace Rule 5605(a)(2). Functions of the Compensation Committee, include, but are not limited to: reviewing and approving, or recommending the Board approve, compensation arrangements for our executive officers, including salary and payments under the Company’s equity-based plans; reviewing compensation for non-employee directors and recommending changes to the Board; and administering our stock compensation plans. Our principal executive officer annually reviews the performance of each of the named executive officers and other officers and makes recommendations regarding the named executive officers and other officers and managers of the company, while the Compensation Committee reviews the performance of our principal executive officer. The conclusions and recommendations resulting from our principal executive officer’s review are then presented to the Compensation Committee for its consideration and approval. The Compensation Committee can exercise its discretion in modifying any of our principal executive officer’s recommendations. The Compensation Committee may delegate its authority to a subcommittee of its members. In performing its functions, the Compensation Committee may retain or obtain the advice of such compensation consultants, legal counsel and other advisors. In February 2018, the Compensation Committee retained Haigh & Company as its independent compensation consultant. With the assistance of Haigh & Company, the Compensation Committee developed and implemented an organizational framework covering salary, annual bonus and equity ownership, with the goal of attracting and retaining talented individuals who are critical to the Company’s long-term success and aligning pay with performance. However, the Compensation Committee has not, at this time, engaged Haigh & Company or any other compensation consultant for 2019. Based on the information received from the consultant, the Compensation Committee believes that the work Haigh & Company performed in 2018 did not raise a conflict of interest and that it was fully independent. The Board does not have a standing nominating committee; instead, as permitted under Nasdaq Listing Rule 5605(e), a majority of the independent directors of the Board recommend director nominees for the consideration of the full Board. The Board believes the independent directors are able to properly select or approve director nominees who will become valuable members of the Board without requiring the formation of a standing nominating committee at this time. Each of our independent directors participates in this process, and Messrs. Ayyar, Blumenfeld, Melton, Moore and Potts recommended the nominees for directors contained in this proxy statement. The Chairman sets the agenda for Board meetings with the understanding that the Board is responsible for providing suggestions for agenda items that are aligned with the advisory and monitoring functions of the Board. Agenda items that fall within the scope of responsibilities of a committee of the Board are reviewed with the chair of that committee. Any member of the Board may request that an item be included on the agenda. Board materials related to agenda items are provided to Board members sufficiently in advance of Board meetings to allow the directors to prepare for discussion of the items at the meeting. At the invitation of the Board, members of senior management recommended by the Chairman attend Board meetings or portions thereof for the purpose of participating in discussions. During 2018, our Board held five meetings of the full Board, four Audit Committee meetings and four Compensation Committee meetings. Each of the incumbent directors attended at least seventy-five percent (75%) of the total number of meetings of the Board held during the period for which he was a director and the total number of meetings held by all committees of the Board on which he served during the periods that he was a member of that committee, other than Mr. Blumenfeld. As set forth in our Corporate Governance Guidelines, our directors are expected to attend our annual stockholders’ meeting. Each of our current directors who served during the 2018 Annual Meeting of Stockholders (the “2018 Annual Meeting”), other than Mr. Blumenfeld, attended such annual meeting. Our executive officers are responsible for the day-to-day management of risks the Company faces, while our Board has an advisory role in the Company’s risk management process, as a whole and at the committee level, and, in particular, the Board is responsible for monitoring and assessing strategic and operational risk exposures, including cybersecurity risk. The Board and committees rely on the representations of management, the external audit of our financial and operating results, our systems of internal control and our historic practices when assessing the Company’s risks. The Audit Committee oversees management of financial risk exposures and the steps management has taken to monitor and control these exposures, and additionally provides oversight of internal controls. The Compensation Committee, in conjunction with the Audit Committee, assesses and monitors whether any of the Company’s compensation policies and programs have the potential to encourage excessive risk-taking. While each committee is responsible for evaluating certain risks and overseeing the management of such risks, the entire Board is regularly informed about such risks by committee reports, as well as advice and counsel from expert advisors. Any transaction with a related person is subject to our written policy for transactions with related persons. Pursuant to such policy, our Audit Committee reviews in advance all related person transactions. The Audit Committee shall approve only those related person transactions that are determined to be in, or not inconsistent with, the best interests of the Company and its stockholders, taking into account all available facts and circumstances as the Audit Committee determines in good faith to be necessary. These facts and circumstances will typically include, but not be limited to: whether the transaction was undertaken in the ordinary course of business of the Company; the purpose and potential benefits of the transaction to the Company; the terms of the transaction and of comparable transactions that would be available to unrelated third parties or to employees generally; and the impact on a director’s independence in the event the related person is a director, an immediate family member of a director or an entity in which a director is a partner, stockholder or executive officer. In reviewing and approving such transactions, the Audit Committee shall obtain, or shall direct management to obtain on its behalf, all information that the Audit Committee believes to be relevant and important to a review of the transaction prior to its approval. The Audit Committee may adopt any further policies and procedures relating to the approval of related person transactions that it deems necessary or advisable from time to time. We maintain an insider trading policy that applies to our officers and directors that prohibits trading our securities when in possession of material non-public information. It also prohibits the hedging of our securities, including short sales or purchases or sales of derivative securities based on our securities, and, unless an exemption is approved by our Audit Committee, the pledging of our securities. Since the adoption of our insider trading policy, the Audit Committee has not granted any such exemptions to the policy’s general prohibition on pledging. Our Board has adopted a Code of Business Conduct and Ethics that applies to all of our employees, officers and directors, including our principal executive officer, principal financial officer and principal accounting officer. The Code of Business Conduct and Ethics is posted on our website at https://www.sgblocks.com under the “Investors—Corporate Governance” tab, and is available free of charge, upon request to our Corporate Secretary at SG Blocks, Inc., 195 Montague Street, 14th Floor, Brooklyn, New York 11201; telephone number: (646) 240-4235. Any substantive amendment of the Code of Business Conduct and Ethics, and any waiver of the Code of Business Conduct and Ethics for executive officers or directors, will be made only after approval by the Board or a committee of the Board and will be disclosed on our website. In addition, any such waiver will be disclosed within four days on a Form 8-K filed with the SEC if then required by applicable rules and regulations. Our director compensation program is designed to attract and retain highly qualified directors and align their interests with those of our stockholders. We compensate directors who are not employed by the Company with a combination of cash and equity awards. Messrs. Galvin and Shetty did not receive any compensation for serving on our Board in 2018. The Compensation Committee reviews the director compensation program and recommends proposed changes for approval by the Board. As part of this review, the Compensation Committee considers the significant amount of time expended, and the skill level required, by each director not employed by the Company in fulfilling his or her duties on the Board, each director’s role and involvement on the Board and its committees and the market compensation practices and levels of our peer companies. During its annual review of the director compensation program in 2018, the Compensation Committee considered an analysis prepared by its independent consultant, Haigh & Company, which summarized director compensation trends for independent directors and pay levels at the same peer companies used to evaluate the compensation of our named executive officers. Following this review, and after considering the advice of Haigh & Company about market practices and pay levels, the Compensation Committee recommended, and the Board approved, the new compensation program for non-employee directors described below. * Such fee to be in effect in the event the Board forms such committee. The above fees will be paid quarterly in advance, in four equal installments, to each person serving as a non-employee director at the time when such payment is made. Beginning with the 2019 calendar year, non-employee directors may choose to receive the $30,000 annual Board retainer as equity in restricted stock units (“RSUs”), in either a $15,000 or $30,000 increment, effective January 15 of the year in which the annual cash retainer is otherwise earned. Among other things, each RSU granted represents the right to receive one share of Common Stock; vests one year after grant, subject to the recipient’s continued service as a director of the Company through such date; and is payable six months after the termination of the director from the Board or death or disability. Directors receive no additional per-meeting fee for Board or committee meeting attendance. In addition, pursuant to the SG Blocks, Inc. Stock Incentive Plan, non-employee directors will receive an annual grant of RSUs (the “Equity Awards”), with a grant date value of $30,000. The grant date of the Equity Awards will generally be the date of the Company’s annual meeting of stockholders during the year of grant. The Equity Awards will be granted pursuant to the form of Restricted Share Unit Agreement (the “RSU Agreement”) adopted by the Board in connection with the new compensation arrangements. Among other things, the RSU Agreement provides that each Equity Award (i) represents the right to receive one share of Common Stock per RSU granted; (ii) vests on the earlier of (A) the first anniversary of the date of grant or (B) the date of the annual meeting of the Company’s stockholders that occurs in the year immediately following the date of grant, subject to the recipient’s continued service as a director of the Company through such date; and (iii) is payable six months after the termination of the director from the Board or death or disability. The Equity Awards for 2018 service were granted on July 26, 2018 to the non-employee directors serving as of the conclusion of the Company’s annual meeting of stockholders held on June 1, 2018, with each such director receiving a grant of 5,591 RSUs, and will vest on the date of the Annual Meeting. Prior to July 26, 2018, in connection with their election or appointment to the Board, directors serving on a committee of the Board received a grant of options to purchase 16,667 shares of Common Stock, and directors who were not serving on any Board committees received a grant of options to purchase 13,334 shares of Common Stock. The option grants vested in four equal quarterly installments at the end of each fiscal quarter following the grant date, so long as the grantee remained a director of the Company. In connection with special committees that the Board may form from time to time in connection with various transactions or undertakings, the Board may award additional compensation to the directors, in its discretion, for membership on such special committees. The Board may, from time to time, grant additional merit-based cash or equity compensation to non-employee directors for extraordinary service. All directors are reimbursed for expenses incurred in connection with each Board and committee meeting attended. The following table sets forth information regarding all forms of compensation that were both earned by and paid to our non-employee directors during the year ended December 31, 2018. The compensation arrangements for Messrs. Galvin and Shetty are disclosed in the Summary Compensation Table set forth in the “Executive Compensation” section of this proxy statement. Neither Mr. Galvin nor Mr. Shetty received compensation for their services as a director during the year ended December 31, 2018. This column indicates the aggregate grant date fair value, as determined in accordance with Financial Accounting Standards Board Accounting Standards Codification Topic 718, Compensation — Stock Compensation (“FASB ASC Topic 718”), of the RSUs granted in July 2018. See “Note 13 – Share-based Compensation” of the Notes to Consolidated Financial Statements contained in our Annual Report on Form 10-K for the year ended December 31, 2018 for an explanation of the assumptions made in valuing these awards. Each of our current non-employee directors serving at the time of the 2018 Annual Meeting received a grant of 5,591 RSUs, effective July 26, 2018, which will vest on the date of the Annual Meeting. (2) Amount includes fees ($7,500 for Mr. Blumenfeld) earned for Board and committee service in the fourth quarter of fiscal 2018 that remain unpaid. (3) Mr. Kaufman did not stand for re-election at the 2018 Annual Meeting held on June 1, 2018. (4) Mr. McAvoy voluntarily resigned from the Board August 2, 2018, at which time his unvested RSUs were forfeited and were no longer outstanding. (5) As Mr. Potts was appointed to the Board on December 27, 2018, he did not receive compensation for services during 2018. The Audit Committee has appointed Whitley Penn, an independent registered public accounting firm, to audit our financial statements for the fiscal year ending December 31, 2019. Whitley Penn has served as the Company’s independent registered public accounting firm since July 28, 2016. The Board proposes that the stockholders ratify this appointment. We expect that representatives of Whitley Penn will be present at the meeting, will be able to make a statement if they so desire and will be available to respond to appropriate questions. Although stockholder approval of this appointment is not required by law or binding on the Audit Committee, the Audit Committee believes that stockholders should be given the opportunity to express their views. If the stockholders do not ratify the appointment of Whitley Penn as the Company’s independent auditors, the Audit Committee will consider this vote in determining whether to continue the engagement of Whitley Penn. The Board unanimously recommends that stockholders vote “FOR” the ratification of the appointment of Whitley Penn as our independent registered public accounting firm. (1) Audit fees include fees paid to Whitley Penn for professional services rendered for the audit for our annual financial statements and reviews of the financial statements included in our Quarterly Reports on Form 10-Q and fees related to securities registration statements and related comfort letter procedures. (2) Audit-related fees principally involve other assurance and related services. (3) Tax services include tax compliance and tax planning consulting services. No tax services were performed for us by Whitley Penn in 2018 or 2017. (4) No other services were performed for us by Whitley Penn in 2018 or 2017. As discussed in “The Board and its Committees—Board and Committee Responsibilities—Audit Committee,” the Audit Committee has implemented pre-approval procedures consistent with the rules adopted by the SEC. The Audit Committee has determined that the provision of the services by Whitley Penn reported hereunder had no impact on its independence. This proposal requires the affirmative vote of a majority of the total number of shares present in person or represented by proxy at the Annual Meeting and entitled to vote. Abstentions will count as a vote “AGAINST” this proposal. Brokerage firms have authority to vote customers’ unvoted shares held by the firms in street name on this proposal. If a broker does not exercise this authority, such broker non-votes will have no effect on the results of this vote. Shares represented by properly executed proxies will be voted, if specific instructions are not otherwise given, in favor of this proposal. THE BOARD UNANIMOUSLY RECOMMENDS THAT STOCKHOLDERS VOTE “FOR” THE RATIFICATION OF THE SELECTION OF WHITLEY PENN LLP AS THE COMPANY’S INDEPENDENT REGISTERED PUBLIC ACCOUNTING FIRM FOR THE YEAR ENDING DECEMBER 31, 2019. The Audit Committee oversees our financial reporting process on behalf of the Board. Management has the primary responsibility for the consolidated financial statements and the reporting process, including the systems of internal control. In fulfilling its oversight responsibilities, the Audit Committee has reviewed and discussed the audited consolidated financial statements included in our Annual Report on Form 10-K for the year ended December 31, 2018 with management, including a discussion of the quality, not just the acceptability, of the accounting principles, the reasonableness of significant judgments and the clarity of disclosures in the consolidated financial statements. The Audit Committee also has reviewed and discussed with Whitley Penn, our independent registered public accounting firm, which is responsible for expressing an opinion on the conformity of those consolidated financial statements with accounting principles generally accepted in the United States, its judgments as to the quality, not just the acceptability, of our accounting principles and such other matters as are required to be discussed with the committee by the Statement on Auditing Standard No. 1301, Communications with Audit Committees, as adopted by the U.S. Public Company Accounting Oversight Board. In addition, the Audit Committee has received the written disclosures and the letter from Whitley Penn required by the applicable requirements of the Public Company Accounting Oversight Board regarding the independent accountant’s communications with the Audit Committee concerning independence, and has discussed with Whitley Penn its independence. Based on the considerations and discussions referred to above, the Audit Committee recommended to our Board (and the Board approved) that the audited consolidated financial statements for the year ended December 31, 2018 be included in our Annual Report on Form 10-K for the year ended December 31, 2018, as filed with the SEC. As required by the Dodd-Frank Wall Street Reform and Consumer Protection Act of 2010 and Section 14A of the Exchange Act, we are providing stockholders with the opportunity to cast an advisory, non-binding vote regarding the compensation of our named executive officers. The most recent advisory vote on named executive officer compensation was held at our 2018 Annual Meeting, and approximately 94% of our stockholders who cast a vote on the matter voted in favor of the compensation of our named executive officers. At the 2018 Annual Meeting, stockholders approved, by advisory vote, an annual frequency for future advisory votes on the compensation of our named executive officers. This advisory vote was accepted by our Board. Stockholders are expected to have the opportunity to vote on the frequency of future votes on named executive officer compensation at the 2024 Annual Meeting. This proposal allows our stockholders to express their views on the compensation of our named executive officers. This vote is not intended to address any specific item of compensation or any single compensation philosophy, policy or practice, but rather the overall compensation of our named executive officers as described in this proxy statement. While the Board values the opinions of our stockholders, this vote is advisory and is not binding on the Company, the Board or the Compensation Committee. We will consider the results of the vote, along with other relevant factors, when evaluating our executive compensation practices and considering future executive compensation arrangements. This proposal requires the affirmative vote of a majority of the total number of shares present in person or represented by proxy at the meeting and entitled to vote. Abstentions will count as a vote “AGAINST” this proposal, and broker non-votes will have no effect on the vote. Shares represented by properly executed proxies will be voted, if specific instructions are not otherwise given, in favor of this proposal. Stevan Armstrong has served as the Chief Technology Officer of the Company since February 1, 2018. Prior to that, Mr. Armstrong served as the Company’s President and Chief Operating Officer since consummation of the Merger on November 4, 2011. Mr. Armstrong served as a director of the Company from November 4, 2011 until July 1, 2016. Mr. Armstrong is a founder of SGBlocks, LLC. Prior to the Merger, Mr. Armstrong served as the President and Chief Operating Officer of the Company and its predecessor entity since April 2009 and as a director of the Company and its predecessor entity since January 2007. From 2003 until fully phasing out in March 2010, he was a minority partner (owner) and Chief Construction Officer for Stratford Companies, a large senior housing development group, where he had complete responsibility for all engineering, design construction and commissioning of over $250,000,000 of facilities over a three-year period. Prior to that, he was the Executive Vice President for Operations of Hospital Affiliates Development Corp., a proprietary health care company specializing in the development of healthcare and senior care projects both domestically and internationally. Mr. Armstrong managed the design and construction of healthcare and elderly care housing projects in 40 states and 16 foreign countries with overall responsibility for operations. His background includes structural design engineering for large-scale healthcare projects, project scheduling and management of development of construction budgets. He spent much of his early career working on-site as a field engineer and construction specialist. Mr. Armstrong served 30 years on active and reserve duty as a Civil Engineering Corps Officer for the U.S. Navy, retiring as Assistant Chief of Staff for Operations for the Atlantic Seabees (Navy Construction Battalions) both Active and Reserve based out of Norfolk, Virginia, with 8,000 engineering and construction troops reporting to headquarters. Mr. Armstrong was responsible for their operations both in the U.S. and worldwide. Mr. Armstrong holds a Bachelor of Architectural Engineering from Pennsylvania State University and a Master’s in Engineering from George Washington University. Mr. Armstrong brings extensive design, construction, and engineering expertise to the Company and his pertinent experience, qualifications, attributes, and skills include real estate and development expertise. On October 15, 2015, the Company and its subsidiaries filed voluntary petitions for reorganization under Chapter 11 of the United States Bankruptcy Code in the United States Bankruptcy Court for the Southern District of New York. At that time, Mr. Galvin and Mr. Armstrong served as executive officers and directors of the Company. Each continued to serve as an executive officer following the Company’s emergence from bankruptcy on June 30, 2016, but Mr. Armstrong left the Board effective July 1, 2016. Executive officers are appointed by, and serve at the discretion of, the Board. The following discussion and table relates to compensation arrangements on behalf of, and compensation paid by our Company to, Paul M. Galvin, Stevan Armstrong and Mahesh S. Shetty. (1) Amounts in this column represent a special bonus payment, which will be paid in RSUs, to each of Messrs. Galvin and Shetty of $127,500 and Mr. Armstrong of $30,000, as described further under “Narrative Disclosure to Summary Compensation Table – Special Retention Bonus Payments” below. Such RSUs will vest in three equal annual installments, beginning on December 31, 2020, and will be delivered within 90 days of when the executive is no longer employed by the Company. (2) Represents the aggregate grant date fair value of stock options granted to the named executive officers in the applicable year computed in accordance with FASB ASC Topic 718, excluding the effect of estimated forfeitures. For a description of the assumptions used in valuing these awards, see “Note 13 – Share-based Compensation” of the Notes to Consolidated Financial Statements contained in our Annual Report on Form 10-K for the year ended December 31, 2018. (3) On March 22, 2019, the Compensation Committee approved payment of bonuses of $93,624 to Mr. Galvin, $75,000 to Mr. Shetty and $11,667 to Mr. Armstrong, based their achievement of the performance criteria described under “Narrative Disclosure to Summary Compensation Table – Bonus Payments” below. The Compensation Committee determined to pay each of these bonus payments in the form of RSUs, which will vest on December 31, 2019 and will be delivered to each employee on January 1, 2020. (4) For 2018, all other compensation consisted of: Mr. Galvin – automobile allowance of $9,600 and phone allowance of $1,668; Mr. Shetty – automobile allowance of $9,600, phone allowance of $1,500 and $4,000 in matching contributions under the Company’s qualified 401(k) plan; and Mr. Armstrong – phone allowance of $1,800. For 2017, all other compensation consisted of: Mr. Galvin – automobile allowance of $9,600 and phone allowance of $2,183; Mr. Shetty – automobile allowance of $9,600 and phone allowance of $1,250; and Mr. Armstrong – phone allowance of $2,476. (5) During 2018, Messrs. Galvin and Shetty earned salary compensation of $370,000 and $300,000, respectively, for their duties as Chairman and Chief Executive Officer, and President and Chief Financial Officer, respectively. Messrs. Galvin and Shetty voluntarily deferred $110,400 and $106,856, respectively, of their annual base salary during 2018. Such deferred salary amounts will be paid during 2019 in the form of RSUs. The RSUs received by Messrs. Galvin and Shetty for deferred salary will vest on December 31, 2019 and will be payable on January 1, 2020. (6) For 2017, the amount of salary reflected payments of $65,000 to RSM Advisors, Inc., a financial consulting business of which Mr. Shetty is the principal. Following is a brief summary of each core element of the compensation program for our named executive officers. ATRM Holdings Inc. Huttig Building Products Nobility Homes Inc.
Cadus Corporation Innsuites Hospitality Trust Sotherly Hotels Inc.
Comstock Holding Companies Inspired Builders Inc. Surna Inc.
First Real Estate Investment Trust New Home Company UCP Inc.
On July 24, 2018, based on the assessment provided by Haigh & Company, the Compensation Committee also established the performance criteria for Messrs. Galvin and Shetty’s 2018 bonus awards and set their target bonus opportunity equal to 100% of base salary. The performance goals were based on the achievement of certain revenue, EBITDA and backlog results, which represented 45%, 35% and 20%, respectively, of the target award. Actual amounts payable for each component could range from 0% to 150% of the target award, based upon the extent to which performance under each component was below, met or exceeded the target, as determined by the Compensation Committee. For this purpose, (i) revenue is defined as consolidated operating revenue as reported in the Company’s Annual Report on Form 10-K for the year ended December 31, 2018, adjusted to remove the revenues of any business acquired or sold during the year, (ii) EBITDA is defined by reference to the Annual Report on Form 10-K for the year ended December 31, 2018, with an addback for non-cash U.S. generally accepted accounting principles (GAAP) charges, and (iii) backlog is defined as the amount of revenue the Company expects to realize from work to be performed on uncompleted contracts in progress and from contractual agreements in effect at December 31, 2018, on which work has not yet begun. Backlog reflected in the Company’s Form 10-K for the year ended December 31, 2018 excluded a contract of $27.5 million which was moved into pipeline pending further analysis on the optimal use of the subject property. The bonus earned by each named executive officer for 2018, which is payable in RSUs that will vest on December 31, 2019 and will be payable to each employee on January 1, 2020, is set forth in the Non-Equity Incentive Plan Compensation column of the “Summary Compensation Table” of this Proxy Statement. On March 22, 2019, the Compensation Committee awarded special retention bonus payments, payable as RSUs, to Messrs. Galvin, Shetty and Armstrong in the amounts of $127,500, $127,500 and $30,000, respectively, in recognition of their contributions to the Company and the Company’s 2018 performance. Such RSUs will vest in three equal annual installments, commencing December 31, 2020, and will be delivered within 90 days of when the executive is no longer employed by the Company. These payments are included in the Bonus column of the “Summary Compensation Table” of this Proxy Statement. In the past, we generally offered stock options to our key employees, including our named executive officers, as the long-term incentive component of our compensation program. Our stock options allow key employees to purchase shares of our Common Stock at a price per share equal to the fair market value of our common stock on the date of grant, and may be intended to qualify as “incentive stock options” under the Internal Revenue Code. Effective March 30, 2018, each of Messrs. Galvin, Shetty and Armstrong were granted options to purchase 82,154, 81,342 and 14,842 shares of Common Stock, respectively, with an exercise price of $4.61 per share. The options vest in equal quarterly installments over a two year period and will fully vest by the end of December 2019, in accordance with the underlying option award agreement. The options were granted in connection with the Company’s performance during 2017, based upon certain revenue and net income targets. We employ Mr. Galvin, our Chief Executive Officer and Chairman of the Board, pursuant to employment agreement, effective January 1, 2017. The employment agreement provides for an initial term of two years, with automatic renewals unless earlier terminated pursuant to the provisions of the employment agreement. The employment agreement provides for base compensation in the amount of $240,000 per year, as later increased to $370,000, and incentive compensation at the discretion of our Board. Mr. Galvin was granted 77,014 options in connection with his employment and 19,800 options in connection with his performance and the Company’s performance since its emergence from bankruptcy in June 2016. Mr. Galvin also received options to purchase 185,425 shares of Common Stock granted in connection with our public offering of common shares in June 2017. The agreement further provides for the payment of severance compensation in an amount equal to the greater of (i) the remainder of his base annual salary or (ii) one year of the his base annual salary, if his employment is terminated by the Company other than for “Cause,” as defined therein. We employ Mr. Shetty, our Chief Financial Officer and President, pursuant to an employment agreement, effective January 1, 2017. The employment agreement provides for an initial term of two years, with automatic renewals unless earlier terminated pursuant to the provisions of the employment agreement. Mr. Shetty was appointed President, in addition to his roles as Chief Financial Officer and member of the Board, effective February 1, 2018. Mr. Shetty’s employment agreement provides for base compensation in the amount of $180,000 per year, as later increased to $300,000, and incentive compensation at the discretion of our Board. Mr. Shetty was granted 55,838 options in connection with his employment and 13,200 options in connection with his performance and the Company’s performance since our emergence from bankruptcy in June 2016. Mr. Shetty also received options to purchase 132,446 shares of Common Stock granted in connection with our public offering of common shares in June 2017. The agreement further provides for the payment of severance compensation equal to one year of his base annual salary if his employment is terminated by the Company other than for “Cause,” as defined therein. We employ Mr. Armstrong, our Chief Technology Officer, pursuant to an employment agreement, effective January 1, 2017, which provides for base compensation in the amount of $140,000 per year and incentive compensation at the discretion of our Board. The employment agreement provides for an initial term of two years, with automatic renewals unless earlier terminated pursuant to the provisions of the employment agreement. Mr. Armstrong previously served as our President and Chief Operating Officer until his appointment as Chief Technology Officer, effective February 1, 2018. Mr. Armstrong was granted 21,281 options in connection with his employment and 13,200 options in connection with his performance and the Company’s performance since our emergence from bankruptcy in June 2016. The agreement further provides for the payment of severance compensation equal to one year of his base annual salary if his employment is terminated by the Company during the initial term of his employment agreement other than for “Cause,” as defined therein. In addition, Mr. Armstrong’s outstanding options become immediately vested and exercisable in full if his employment is terminated by the Company without Cause or by Mr. Armstrong for “Good Reason,” as defined therein, within two years after a “Change in Control” (as defined in the Incentive Plan). Our executive officers are eligible to participate in our employee benefit plans and programs, including medical benefits, flexible spending accounts, short- and long-term disability and life insurance, to the same extent as our other full-time employees, subject to the terms and eligibility requirements of those plans. Our executive officers are also eligible to participate in a tax-qualified 401(k) defined contribution plan to the same extent as our other full-time employees. Currently, we do not match contributions made by participants in the 401(k) plan or make other contributions to participant accounts. (1) In connection with a public offering by the Company, completed in June 2017, Messrs. Galvin and Shetty were each granted performance-based option awards, to vest upon the completion of certain conditions. A portion of the shares were granted at an exercise price to equal the price per share at which the public purchased shares in the offering ($5.00 per share), while the remainder were granted at an exercise price equal to 120% of such price per share ($6.00 per share). In September 2017, the Compensation Committee determined that each of Messrs. Galvin and Shetty met his respective performance conditions, and the option awards vested in full. (2) With respect to Mr. Galvin, 19,800 options vested on the grant date, while the remaining 77,014 vested in equal quarterly installments on the last day of each fiscal quarter following the date of grant over a two-year period. With respect to Mr. Shetty, 13,200 options vested on the grant date, while the remaining 55,838 vested in equal quarterly installments on the last day of each fiscal quarter following the date of grant over a two-year period. With respect to Mr. Armstrong, 13,200 vested on the grant date, while the remaining 21,281 vested in equal quarterly installments on the last day of each fiscal quarter following the date of grant over a two-year period. All options vested in full as of December 31, 2018. (3) Of these options, 43,676 vested on the grant date, while the remainder will vest in three equal installments of 18,199 on the three anniversaries following the grant date. Such options will vest in full as of November 1, 2019. (4) Messrs. Galvin and Shetty received these options in connection with their service as directors of the Company. The options vested in equal quarterly installments on the last day of each fiscal quarter following the date of grant and vested in full as of September 30, 2017. (5) Of these options, 10,919 vested on the date of grant, while the remaining 10,920 vested on February 21, 2017, upon the filing of the Annual Report on Form 10-K for the year ended December 31, 2016. (6) Of these options, 21,839 vested on the grant date, while the remainder vested in two equal installments of 10,919 on the anniversary of the grant date, and vested in full as of November 1, 2018. (7) These options vest in equal quarterly installments over a two year period, beginning March 31, 2018, and will vest in full as of December 31, 2019. (1) Includes 1,155,059 shares issuable upon the exercise of options and 22,364 shares issuable upon the vesting of restricted stock units outstanding under the SG Blocks, Inc. Stock Incentive Plan. (2) Represents shares available for issuance under the SG Blocks, Inc. Stock Incentive Plan. The following table sets forth the number of shares of Common Stock beneficially owned as of the Record Date by: (i) each person known by the Company to own beneficially more than 5% of the outstanding shares of Common Stock; (ii) each director of the Company; (iii) each executive officer of the Company; and (iv) all directors and executive officers of the Company as a group. The information is determined in accordance with Rule 13d-3 promulgated under the Exchange Act. Except as indicated below, the stockholders listed possess sole voting and investment power with respect to their shares. (1) Except as otherwise noted, the address of each of the persons listed is: 195 Montague Street, 14th Floor, Brooklyn, New York 11201. (2) Unless otherwise indicated, includes shares owned by a spouse, minor children and relatives sharing the same home, as well as entities owned or controlled by the named person. Also includes options to acquire shares of Common Stock exercisable and time-based restricted stock units vesting within 60 days of the Record Date. (3) The number of shares and the percent beneficially owned by each entity or individual are based upon [●] shares of Common Stock outstanding and assume the exercise of all exercisable options and vesting of all outstanding time-based restricted stock units (including those that would be exercisable or vested within 60 days of the Record Date). The percent beneficially owned is a fraction, the numerator of which is the number of shares of Common Stock beneficially owned by each entity or individual (including any exercisable options, as described herein) and the denominator of which is the number of outstanding shares of Common Stock plus the number of shares of Common Stock which would be issued upon (i) exercise by the subject entity or individual of such entity or individual’s own options and warrants and (ii) vesting of outstanding time-based restricted stock units. This method of computing the percent beneficially owned results in the aggregate ownership percentages of all owners exceeding 100%. (4) Based on a Schedule 13G/A filed February 14, 2019, with respect to holdings as of December 31, 2018. Hillair Capital Investments L.P. (“HCI”), Hillair Capital Management LLC (“HCM”) and Sean M. McAvoy share voting and dispositive power of 293,371 shares of Common Stock. HCI directly owns the shares of Common Stock; HCM, as investment advisor to HCI, may be deemed to have dispositive power over the shares owned by HCI, and Mr. McAvoy, as the manager of HCM, may be deemed to have dispositive power over such shares as well. Each of HCM and Mr. McAvoy disclaims beneficial ownership over such shares except to the extent of its or his pecuniary interest therein. The principal business address of the foregoing is c/o Hillair Capital Management, 345 Lorton Avenue, Suite 303, Burlingame, California 94010. (5) Based on a Schedule 13G filed March 15, 2018, with respect to holdings as of January 24, 2018. David Zelman holds sole voting and dispositive power of 263,329 shares of Common Stock and shares dispositive and voting power of 12,266 shares of Common Stock. Such holdings include held in certain retirement accounts over which Mr. Zelman exercises investment discretion and, therefore, may be deemed to be the beneficial owner. Mr. Zelman disclaims beneficial ownership of the securities held in such retirement accounts. The principal business address of Mr. Zelman is 3333 Richmond Road, Suite 340, Beachwood, Ohio 44122. (6) Includes 37,700 shares of Common Stock held directly by Mr. Galvin and 10,144 shares held by TAG Partners, LLC (“TAG”), an investment partnership formed for the purpose of investing in the Company. Mr. Galvin is a managing member of and has a controlling interest in TAG and may be deemed to beneficially own the share of Common Stock held by TAG, over which he has shared voting and dispositive power. Mr. Galvin disclaims beneficial ownership of the shares of Common Stock held by TAG except to the extent of his pecuniary interest therein. Also includes 426,992 options to purchase our common shares presently exercisable or exercisable within 60 days of the Record Date. Does not include 49,008 options as they are not presently exercisable or exercisable within 60 days of the Record Date. (7) Includes 5,591 RSUs held by each of Messrs. Ayyar, Blumenfeld, Melton, Moore and Potts, which were granted on July 26, 2018 and which will vest on the date of the Annual Meeting, as the earlier of either the date of the Annual Meeting or the one year anniversary of the grant date, subject to the recipient’s continued service as a director of the Company through such date. Each RSU represents a contingent right to receive one share of Common Stock. (8) Includes 16,667 options to purchase our Common Stock presently exercisable or exercisable within 60 days of the Record Date. (9) Includes 20,432 shares of Common Stock directly held by Mr. Blumenfeld. Does not include 5,086 RSUs held by Mr. Blumenfeld, which were granted on January 15, 2019. These RSUs vest in full 12 months after the grant date, subject to the recipient’s continued service as a director of the Company through such date. Each RSU represents a contingent right to receive one share of Common Stock. No RSUs have vested as of the Record Date or will vest within 60 days of such date. (10) Includes 4,000 shares of Common Stock held in Mr. Melton’s retirement account, which Mr. Melton indirectly owns, and 1,546 shares of Common Stock directly held by Mr. Melton. (11) Includes 25,000 shares of Common Stock directly held by Mr. Shetty and 287,497 options to purchase our Common Stock presently exercisable or exercisable within 60 days of the Record Date. Does not include 30,502 options as they are not presently exercisable or exercisable within 60 days of the Record Date. (12) Includes 12,125 shares of Common Stock held by SMA Development Group, LLC, an entity controlled by Mr. Armstrong. Mr. Armstrong and SMA Development Group, LLC, share voting and dispositive power over such shares. Mr. Armstrong disclaims beneficial ownership of such shares, except to the extent of his pecuniary interest therein, and this shall not be deemed to be an admission that Mr. Armstrong is the beneficial owner of such shares. The business address for SMA Development Group, LLC, is 912 Bluff Road, Brentwood, Tennessee 37027. Also includes 87,433 options to purchase our Common Stock presently exercisable or exercisable within 60 days of the Record Date. Does not include 5,567 options as they are not presently exercisable or exercisable within 60 days of the Record Date. The Board has approved, and is asking stockholders to approve, the proposed amendment to the Certificate of Incorporation to reduce the number of authorized shares of Common Stock from 300,000,000 shares to 25,000,000 shares (the “Proposed Amendment”). The number of shares of the Company’s preferred stock, par value $1.00, authorized for issuance under our Certificate of Incorporation would remain unchanged at 5,405,010 shares. Approval of the Proposed Amendment requires the affirmative vote of the holders of a majority of the outstanding shares entitled to vote. At the close of business on the Record Date, there were [●] shares of Common Stock outstanding and entitled to vote. There are no shares of preferred stock outstanding. The purpose of the Proposed Amendment is to reduce, to the extent possible, the Company’s future annual franchise taxes paid to the State of Delaware. As a Delaware corporation, the Company is required to pay an annual franchise tax to the State of Delaware; the amount of such tax payment is determined, in part, by the total number of shares of stock the Company is authorized to issue. Accordingly, the Company expects that the amount of such tax will be reduced if the Company decreases the number of its authorized shares of Common Stock. The Board believes that reducing the number of authorized shares of Common Stock from 300,000,000 to 25,000,000 (leading to a reduction in total authorized shares from 305,405,010 to 30,405,010) will result in annual Delaware franchise tax savings in the future (subject to changes in franchise tax rates by Delaware). In addition, the number of shares of Common Stock currently authorized, 300 million, is very high relative to the number of issued and outstanding shares of Common Stock, which was approximately 4.3 million as of the Record Date. The Board believes that the reduced number of authorized shares of Common Stock of 25,000,000 will maintain a sufficient number of authorized shares of Common Stock to permit the Company to issue such shares when and as the Board determines doing so is in the best interests of the Company and its stockholders, such as pursuant to the Company’s equity compensation plans or in connection with possible future financings, acquisitions, stock dividends and other corporate purposes. If the Proposed Amendment is effected, the number of authorized shares of Common Stock will be decreased from 300,000,000 to 25,000,000. The total number of authorized shares of the Company will be 30,405,010, consisting of 25,000,000 authorized shares of Common Stock and 5,405,010 authorized shares of preferred stock (none of which are currently outstanding). The Proposed Amendment will not change the par value of the shares of the Common Stock, affect the number of shares of Common Stock outstanding or the rights or privileges of holders of shares of the Common Stock or have any effect on any outstanding securities, including outstanding equity awards, that are exercisable, convertible or exchangeable for shares of Common Stock. Effecting the Proposed Amendment could potentially adversely affect the Company. The decrease in the number of shares of Common Stock that would be authorized, but not issued or outstanding, could result in less latitude for the Board to issue shares of Common Stock in the future, including when we determine doing so would be in the best interests of the Company and the stockholders, such as in connection with possible future financings, acquisitions, stock dividends and other corporate purposes. In the event the Board determines that it would be in the Company’s best interests to issue a number of shares of Common Stock in excess of the number of shares then authorized but unissued and unreserved, the Company would be required to seek stockholder approval to increase the number of authorized shares of Common Stock. If the stockholders do not approve such increase in a timely manner, or at all, the Company may be unable to take advantage of one or more opportunities that might otherwise be advantageous to the Company and its stockholders. However, the Board believes that these risks are outweighed by the anticipated benefits of reducing the amount of the Company’s Delaware franchise tax obligations. A form of the certificate of amendment to the Certificate of Incorporation that would be filed with the Delaware Secretary of State to effect the Proposed Amendment is set forth in Appendix A (the “Certificate of Amendment”). If the stockholders approve the Proposed Amendment, the Company intends to file the Certificate of Amendment with the Secretary of State of the State of Delaware as soon as practicable following the Annual Meeting, and the Certificate of Amendment will be effective upon such filing. However, if at any time prior to the effectiveness of the filing of the Certificate of Amendment with the Delaware Secretary of State, the Board determines that it would not be in the best interests of the Company and its stockholders to effect the Proposed Amendment, in accordance with Delaware law and notwithstanding authorization of the Proposed Amendment by the stockholders, the Board may abandon the Proposed Amendment without further action by the stockholders. This proposal requires the affirmative vote of the holders of a majority of the outstanding shares entitled to vote. Abstentions and broker non-votes will have the same effect as a vote “AGAINST” the proposal. Shares represented by properly executed proxies will be voted, if specific instructions are not otherwise given, in favor of this proposal. THE BOARD UNANIMOUSLY RECOMMENDS THAT STOCKHOLDERS VOTE “FOR” THE APPROVAL OF AN AMENDMENT TO THE CERTIFICATE OF INCORPORATION TO DECREASE THE NUMBER OF AUTHORIZED SHARES OF THE COMPANY’S COMMON STOCK FROM 300,000,000 TO 25,000,000. Section 16(a) of the Exchange Act requires our directors and executive officers, and persons who own more than 10% of a registered class of the Company’s equity securities, to file with the SEC initial statements of beneficial ownership and changes in beneficial ownership in ownership of Common Stock and other equity securities of the Company. Officers, directors and greater than 10% stockholders are required by SEC regulations to furnish us with copies of all Section 16(a) forms they file. To our knowledge, based solely on a review of the copies of such reports furnished to us and representations that no other reports were required, we believe that all Section 16 filing requirements applicable to our officers, directors and 10% beneficial owners were timely complied with during the year ended December 31, 2018, except as follows: one open market purchase reported on a Form 4 filed by Yaniv Blumenfeld on August 21, 2018; and three open market purchases reported a Form 4 filed by Mr. Blumenfeld on September 5, 2018. Copies of our Annual Report on Form 10-K for the year ended December 31, 2018, as filed with the SEC, are available, without charge, to stockholders upon written request to our Corporate Secretary at SG Blocks, Inc., 195 Montague Street, 14th Floor, Brooklyn, New York 11201. As of the date of this proxy statement, our Board and management do not know of any other business that will be presented for consideration at the Annual Meeting, other than as described in this proxy statement. If, however, other matters are properly brought before the Annual Meeting, the persons named as proxies will vote in accordance with their best judgment with respect to such matters. Pursuant to Rule 14a-8 under the Exchange Act, stockholders may present proper proposals for inclusion in our proxy statement for our 2019 Annual Meeting of Stockholders. To be eligible for inclusion in our 2020 proxy statement, any such proposals must be delivered in writing to our Corporate Secretary at our principal executive offices no later than December 28, 2019 and must meet the requirements of Rule 14a-8 under the Exchange Act. The submission of a stockholder proposal does not guarantee that it will be included in our proxy statement. In addition, our bylaws have an advance notice procedure with regard to nominations for the election of directors to be held at an annual meeting of stockholders by any stockholder. In general, the Company will consider nominations for directors submitted by any stockholder only if such stockholder has given timely notice in proper written form of such nomination or nominations, setting forth certain specified information. To be timely, notice must be received by the Chairman of the Board no later than 60 days prior to the anniversary date of the immediately preceding annual meeting. For the 2020 Annual Meeting of Stockholders, notice must be received no later than April 6, 2020. 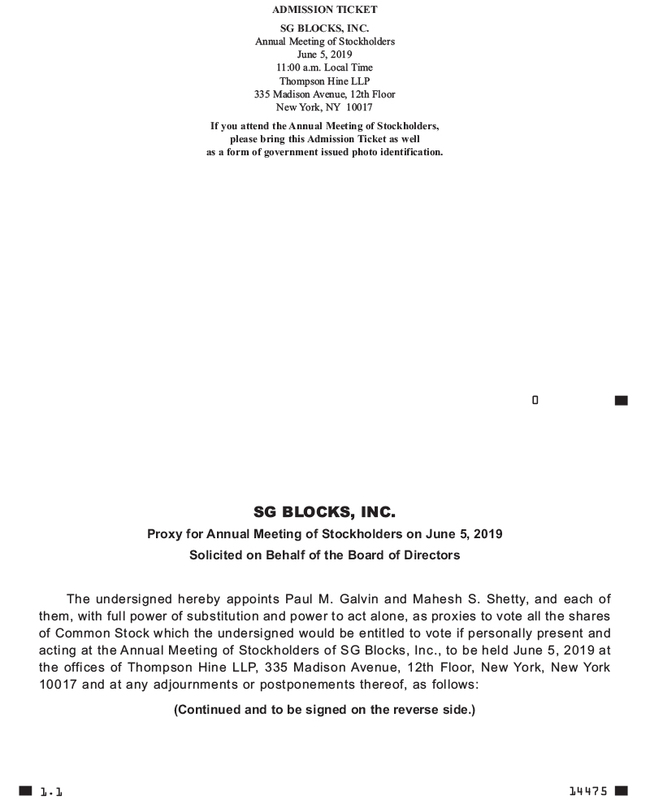 Notices of intent to nominate candidates for election as directors or other stockholder communications should be submitted to: SG Blocks, Inc., 195 Montague Street, 14th Floor, Brooklyn, New York 11201, Attention: Corporate Secretary. Any proxy granted with respect to the 2020 Annual Meeting of Stockholders will confer on the proxy holders discretionary authority to vote with respect to a stockholder proposal or director nomination if notice of such proposal or nomination is not received by our Corporate Secretary within the timeframe provided above. For other stockholder proposals to be properly presented at our 2020 Annual Meeting of Stockholders, but not submitted for inclusion in our proxy statement, under SEC rules, if the Company does not receive notice of such proposal at least 45 days prior to the first anniversary of the date of mailing of the prior year’s proxy statement, the Company’s proxy holders may use their discretionary voting authority when the proposal is raised at the meeting. The deadline for these proposals is March 12, 2020. Stockholders may communicate with our Board or any individual director by sending correspondence addressed to the intended recipient at the following address: SG Blocks, Inc., 195 Montague Street, 14th Floor, Brooklyn, New York 11201. Your communications should indicate whether you are a stockholder of the Company. Depending on the subject matter, we will either forward the communication to the director or directors to whom it is addressed or attempt to handle the inquiry directly. If the communication is unduly hostile, threatening, illegal, does not reasonably relate to the Company or its business or is similarly inappropriate, we will not forward the communication. The SEC has adopted rules that permit companies and intermediaries (such as brokers) to implement a delivery procedure called “householding.” Under this procedure, multiple stockholders who reside at the same address may receive a single copy of our proxy materials, unless an affected stockholder has provided contrary instructions. This procedure reduces our printing costs and postage fees. We will be householding our proxy materials. A single set of our proxy materials will be delivered to multiple stockholders sharing an address unless contrary instructions have been received from the affected stockholders. Once you have received notice from your broker or us that it or we will be householding communications to your address, householding will continue until you are notified otherwise or until you revoke your consent. Shareholders of record who share an address and would like to receive a separate copy of our proxy materials for future annual meetings, or have questions regarding the householding process, may contact our transfer agent, American Stock Transfer & Trust Company, either by written request or by telephone at 6201 15th Avenue, Brooklyn, New York 11219, telephone 1-800-937-5449. By contacting American Stock Transfer & Trust Company, shareholders of record sharing an address can also request delivery of multiple copies of our Proxy Materials in the future. In addition, upon written or oral request, we will promptly deliver a separate set of proxy materials to any beneficial owner at a shared address to which a single copy of any of those documents was delivered. To receive a separate set of proxy materials, you may write or call the Corporate Secretary of the Company at SG Blocks, Inc., 195 Montague Street, 14th Floor, Brooklyn, New York 11201, Attention: Corporate Secretary, telephone 646-240-4235. FIRST: This Certificate of Amendment amends the provisions of the Corporation’s Amended and Restated Certificate of Incorporation, as filed with the Secretary of State of the State of Delaware on June 30, 2016 and as amended effective February 28, 2017 (the “Certificate of Incorporation”). (a) The total number of shares of all classes of stock which the Corporation shall have authority to issue is 30,405,010 shares, which are divided into (i) 25,000,000 shares of common stock, $0.01 par value per share (“Common Stock”), and (ii) 5,405,010 shares of preferred stock, $1.00 par value per share (the “Preferred Stock”). THIRD: This amendment to the Certificate of Incorporation was submitted to the stockholders of the Corporation and was duly approved by the required vote of stockholders of the Corporation in accordance with Sections 228 and 242 of the General Corporation Law of the State of Delaware. FOURTH: All other provisions of the Certificate of Incorporation shall remain in full force and effect. IN WITNESS WHEREOF, the Corporation has caused this Certificate of Amendment to the Certificate of Incorporation to be signed by its duly authorized officer this 5th day of June, 2019.